Following the release of their debut album, 'Bling' in 2008, which attracted four star responses from the critics, the five-piece have been playing to big audiences and rave reviews at concerts and festivals around Britain and Europe, including the coveted Cambridge Festival; Celtic Connections, Glasgow; Shrewsbury Folk Festival; Moseley Folk Festival; Derby Folk Festival; Bromyard Folk Festival, Whitby Folk Festival a concert tour of Italy, Austria and Belgium along with a number of performances at the Festival Interceltique de Lorient, Brittany, where they've received the award for the best group. 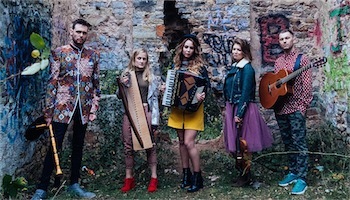 The group, who've raised some eyebrows with a deliberate policy of eye-catching clothes and presentation, despite the ancient roots of their music, see themselves as a new generation of ambassadors, striving to take their new sound to new audiences, while raising the profile of Welsh traditional music on an international level. The band began by busking in the streets of Cardiff raising money to pay for university fees. By 2015 they were performing alongside Bryn Terfel and Sting at the Royal Albert Hall in London as part of Bryn Terfel's 50th birthday party. Sam Humphreys comes from Llyn Peninsula on the beautiful North West Coast of Wales. His music comes from an altogether different background originally playing rock and electronic music in night clubs before discovering a magic mix of folk and modern styles. Alongside being a musician, he has recording/producing/mixing credits on a wide range of Artists and styles. He also worked composing for Film and TV and has worked as a television presenter. Patrick Rimes was junior Celtic Welsh fiddle champion 3 years in succession and plays a multitude of musical instruments including the Welsh bagpipes an instrument popular in Wales and weddings and in the courts and castles of the princes. He has also worked as television music arranger for the singer Bryn Terfel and conducted orchestras. Angharad Jenkins plays fiddle and is the daughter of a famous Welsh poet Nigel Jenkins and whose mother is Delyth Jenkins is a famous harp player. Here within her family she learnt the poetry and music traditions of Wales. She is also a keen worker in encouraging young people to play traditional music by developing projects and workshops throughout the UK. Alice French studied harp at the University of Wales before being drawn into the wealth of traditional harp music Wales has to offer. She is now developing and examining old traditional harp methods of playing used by the Romani Gypsies of Wales.